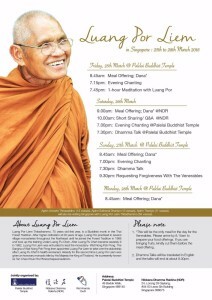 Luang Por Liem will be in Singapore for a short visit from 25th to 28th March. Luang Por Liem Thitadhammo, 75 years old this year, is a Buddhist monk in the Thai Forest Tradition. After higher ordination at 20 years of age, Luang Por practised in several village monasteries throughout the Northeast until he joined the Forest Tradition in 1969 and took up the training under Luang Pu Chah. After Luang Pu Chah became severely ill in 1982, Luang Por Liem was entrusted to lead the monastery – Wat Nong Pah Pong. The Sangha of Wat Nong Pah Pong then appointed Luang Por Liem to take over the abbotship after Luang Pu Chah’s health worsened. Luang Por Liem was also given an honorary monastic title by His Majesty the King of Thailand for a second time. He is presently known as Tan Chao Khun Pra Phrarachapavanavikrom. This entry was posted in Forest Way on March 19, 2016 by wayadmin. This entry was posted in Sunday Morning Service (SMS), Uncategorized on March 4, 2016 by wayadmin.